“Laughing is an easy way to strengthen all immune functions, bring more oxygen to the body and brain, foster positive feelings and improve interpersonal skills” (Laughter Yoga Explained). Day 14 of the Lotus Yoga Off The Mat Challenge theme is Yoga and humor. I love this theme because too often, we take our yoga too seriously! We focus on the quiet, or the challenge of poses, sometimes we even think too much about what intention we should choose for our practice! And in all of this, we lose the beautiful spontaneity that yoga invites us to embrace! Yoga opens us up to all kinds of new possibilities and yes, humor and laughter is definitely one of them. 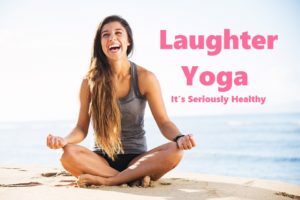 Whenever I catch myself laughing in a yoga class, I tend to quickly recover for fear of appearing immature, but after reading more about humor and the many benefits of laughter, I’m thinking I will not suppress this part of me in future yoga practices. Why not combine the benefits of laughter with the many benefits of yoga? They certainly go hand-in-hand; in fact, they overlap tremendously, so it only makes sense to combine them in a yoga practice! Have you ever heard of laughing yoga? It’s a fairly new trend in the yoga craze sweeping our country. It uses the many yoga breathing techniques and incorporates laughing as a unique form of exercise . There used to be monthly laughing yoga classes at the David Owsley Art Museum on the Ball State University campus, but the teacher, Sarah Lyttle, moved to southern Indiana, so I don’t know if there is laughing yoga offered anymore in the Muncie area. If I find one, I will post the information here. 2) how do you take your yoga practice off the mat and into a humorous perspective on life?